Business keeps getting faster every day and you need to be able to work anywhere—flexibly and collaboratively. With the Galaxy S10 for business, you can do everything you need right on your phone as fast as you need to, and keep your company and personal data protected. Powered by DeX, you don’t have to wait to get back to your laptop to get to work. The powerful all-day intelligent battery1 works as long as you want to, and the intelligent performance system optimizes your experience based on usage and routines. 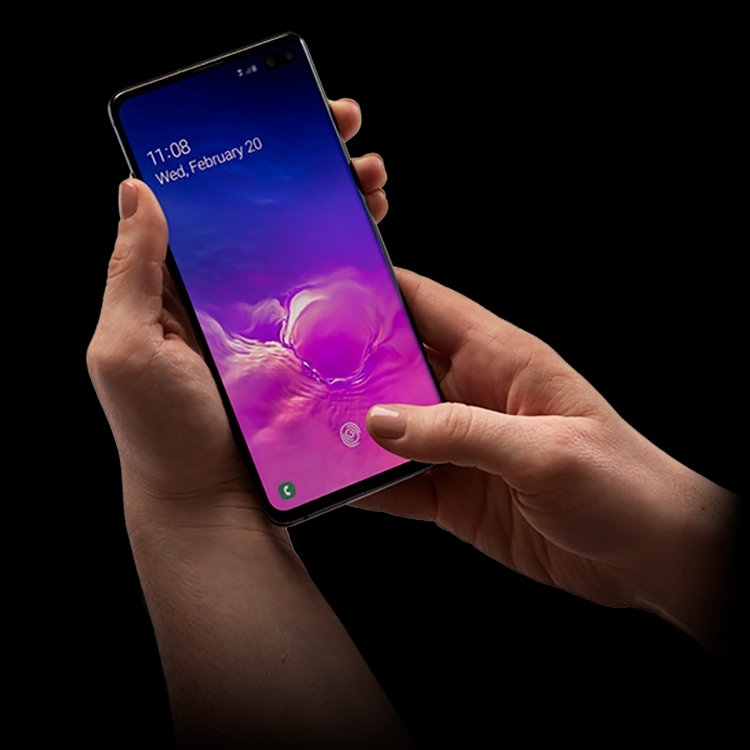 The Galaxy S10 sets new standards for security innovation, with Ultrasonic Fingerprint ID that protects access, Knox defense-grade security from the chip up and configuration capabilities that keep you in control. Leverage the power and flexibility of Samsung’s mobile device portfolio and business services. Our experts will work with you to custom build tailored solutions that are tuned to the needs of your business environment. The business phone that goes all day so you can too. Do more with a powerful processor and keep your data secure with our new ultrasonic fingerprint ID. Exceed expectation with unparalleled processing power and store all your data with more memory. 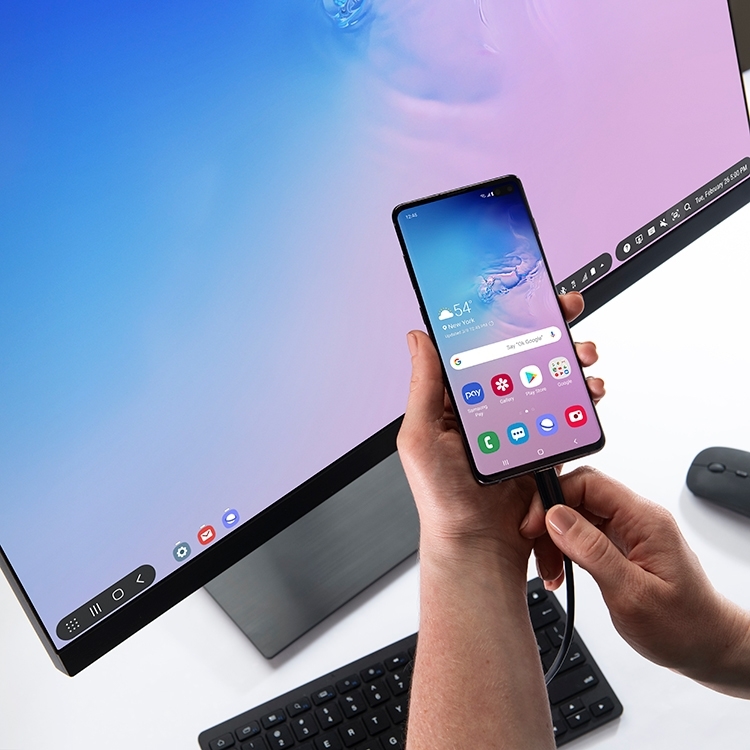 Connect the Galaxy S10 to any monitor with the DeX adapter, and it has the power to perform like a desktop PC.² Using DeX, you can access your desktop anywhere with enterprise-ready VDI solutions.³ With access to Microsoft Office Mobile,⁴ you can view spreadsheets, presentations and documents anytime, anyplace. Connect the Galaxy S10 to any screen with a simple HDMI cable, and it has the power to perform like a desktop PC.² Using DeX, you can access your desktop anywhere with enterprise-ready VDI solutions.³ With access to Microsoft Office Mobile,⁴ you can view spreadsheets, presentations and documents anytime, anyplace. The Galaxy S10 with DeX allows nurses to communicate seamlessly between patients and rooms, all with one device, so there’s more time for patients and less paperwork. Keep your customer first without disrupting your work. With the Galaxy S10 and DeX, your work can start at the desk and finish on the go with one device. Empower your personnel to switch from a laptop experience inside their vehicle, to secure handheld data access in the field, to a desktop experience back at the station with the Galaxy S10 and DeX. Consolidate hardware with the Galaxy S10 and DeX, so you have access to everything you need while in the field, without having to go back and forth between devices. With up to five cameras, you can take true-to-life pictures, even in low-light environments. The Pro-grade Camera lets you capture images just as your eyes see them—whether you’re in the field or a meeting room. Capture a detail or scale to snap your full eye’s view and instantly share them with colleagues. The 16MP ultra-wide lens ensures you don’t miss a single detail. See more than ever before with up to a 6.4” Infinity display. The flawless glass screen has no margins at the top or bottom, and no home button or notch. So, it’s perfect for viewing and editing documents on the go and makes it easy to multi-task across different apps. Sure to turn heads in any environment, the stunning display gives you a better view of presentations, photos or anything you need for work. See only what you need, find focus in what you’re doing and use your phone in a way that feels like second nature. Our new One UI works with the way you use your phone. Screens are uncluttered, icons pop and we’ve made it easier to use one-handed. Secure your phone like never before with Ultrasonic Fingerprint ID.⁵ Simply press your finger and unlock with the first touch. It’s quick and easy to use, so you can access files and get to work in an instant. It works in almost any light, rain or shine, the smallest conference rooms and the great outdoors. The in-display sensor reads every ridge and notch of your finger, to ensure your sensitive data won’t fall into the wrong hands. Secure your phone like never before with Ultrasonic Fingerprint ID.⁵ Simply press your finger and unlock with the first touch. It’s quick and easy to use, so you can access files and get to work in an instant. It works in almost any light, rain or shine, the smallest conference rooms and the great outdoors. From device configuration, enrollment and management to advanced mobile security controls and updates, Samsung has the mobility software you need for every stage of the device lifecycle. Learning from the way you work, the Galaxy S10 monitors apps in the background to optimize how they serve you. Bixby anticipates what you need before you need it, keeping you to your set routines, and maybe even recommending a new one. Observant, helpful intelligence that helps maximize your work day. At Samsung, we’re at the forefront of bringing 5G mobile networks and technology to people everywhere to build our vision of a connected world. Introducing the revolutionary Galaxy S10 5G—the first 5G phone. Be the first to know when it's here. Up to 12GB of RAM (Galaxy S10+) allows you to multitask quickly and effortlessly. Ready to buy the Galaxy S10 for business? Select what type of purchase you’re interested in so we can make your experience seamless. Buy a Galaxy S10 to bring to work, for a family member or to test device integration at your business. 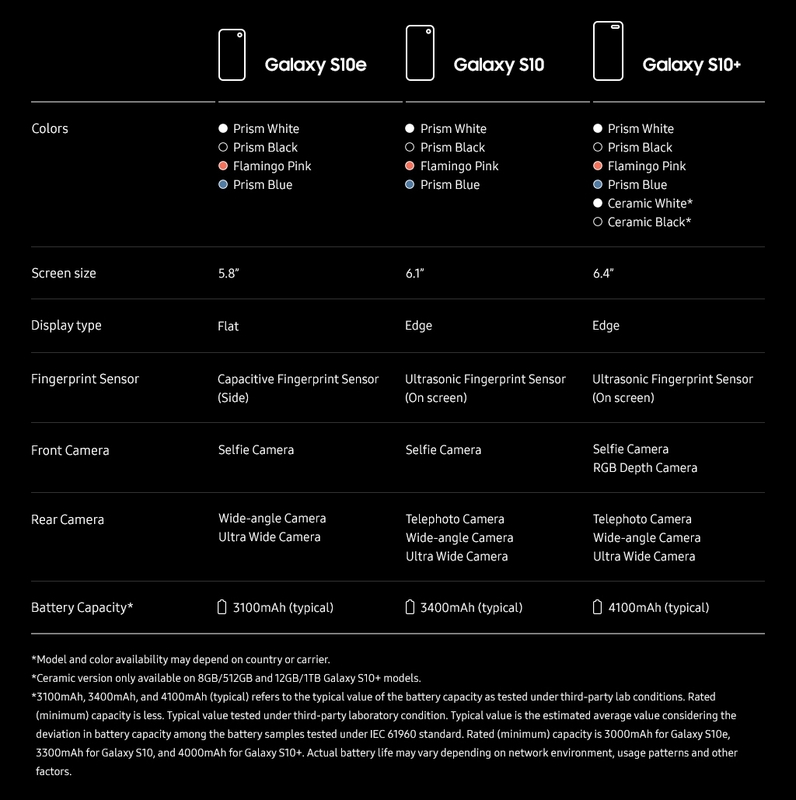 Find out where to buy the Galaxy S10 through your preferred carrier. Or sign up for a Samsung Business Account to buy up to 25 Galaxy S10 Unlocked devices directly. To buy a fleet of Galaxy S10 devices for your business or if you just have questions about making a business purchase, contact a Samsung sales expert. Please provide your contact details and our sales team will get back to you about the Galaxy S10. Or you can call (855) 805-8699 to talk to an expert now. 2Using Samsung genuine HDMI adapter or cable qualified for Samsung DeX is recommended. Accessories and monitor sold separately. 3Third-party VDI solutions sold separately. 4MS Office license required for purchase to edit Excel, Word or PowerPoint documents. License sold separately. 5Ultrasonic Fingerprint ID available on Galaxy S10 and Galaxy S10+. 7Works with Qi compatible Samsung devices (compatibility with non-Samsung Qi devices not guaranteed); speed and power efficiency of charge varies by device. Wireless charger sold separately. 9Water resistant in up to 5 feet of water for up to 30 minutes. Rinse residue/dry after wet.